Lucindaville: How Cool Are French Zombies? My friend , Anne, and I are Francophiles. We both subscribe to Elle à Table and we are always discussing how the French can throw a handful of raw asparagus onto a plate and make it look like art. I am always saying, "How does there food always look so good?" Guess what? Their zombies look good, too. 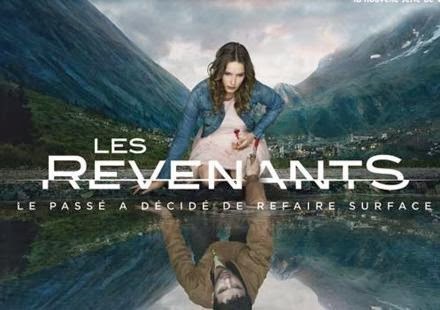 The Sundance Channel is showing Les Revenants as The Returned. It is a French Walking Dead, but those who return from the dead are French. French zombies. Now one might inquire: "What are French zombies like?" Well, of course they are far better looking than American zombies. No rotting flesh, non! That would be so undignified. French zombies return intact, coiffed, well dressed and sporting jaunty scarves. French zombies return from the grave ravenous, but they do not want to eat your fleshy underbelly. A French zombie is looking for a lovely, ripe Camembert and a crusty loaf. French zombies do not shuffle slowly, but comport themselves like dancers. Those returned, and those they have returned to, are faced not with a zombie apocalypse, but with an existential dilemma. For instance, your dead wife returns and causes you to nearly die of a heart attack. Do you find this to be an abomination and kill her? Do you give her more Camembert? Do you ask yourself, "What would Sartre do?" While they might not be grotesque, rotting flesh eaters, the French zombie does seem to create havoc. It is a little early to judge the exact nature of the havoc and whether it is more terrifying than a full on zombie apocalypse. I must confess, however, the thought of a long-dead child showing up in the kitchen raiding the refrigerator may be far more terrifying than a rotting Sophia shuffling out of a barn.